Handcrafted to perfection, our Chesapeaka Panel Bed is sure to make a stunning addition to the heart of any bedroom suite. The beautiful design is crafted with a cozy, rustic charm in mind, offering clean lines and bold detail in the head and foot boards that are versatile enough to incorporate into any decor, but have enough flair to really make the statement you've been looking for. Choose from four different predetermined stain selections (with a two-tone look) to find your favorite combination to incorporate into and bedroom you choose. Add a matching three drawer nightstand or chest to complete the look and furnish a suite that can be enjoyed and handed down for generations to come. Questions? No problem - our furniture specialists are available to answer and questions you have on the Chesapeaka Bedroom Suite. We can also customize the stain options for this quick ship piece, or provide a quote for different wood combinations at a normal lead time to help you find the perfect set to fit your unique decor. 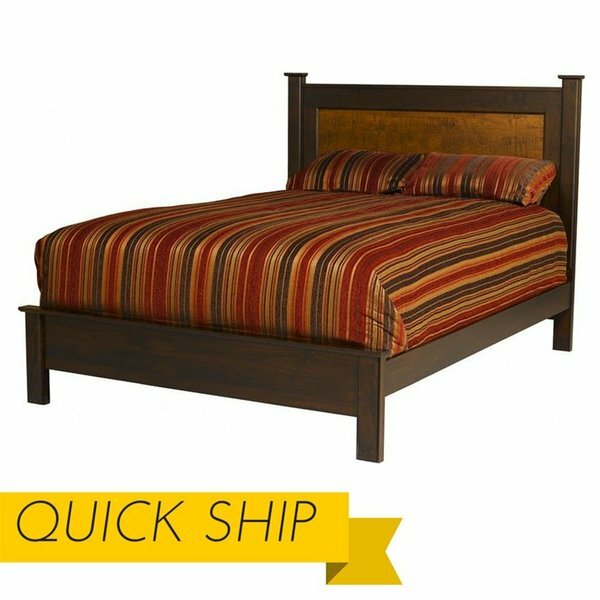 *Available in Queen size as part of our quick ship program, in a gorgeous Brown Maple with Tiger Maple panels in the headboard, this bed can be customized with your preferred stain and will be finished and packed, ready for delivery in two to three weeks. *Quick Ship Item - This item comes standard in a Queen size, crafted from Brown Maple and Tiger Maple - Stained and ready to ship within two - three weeks from purchase. Wanted to let you know that our furniture was delivered Wednesday by a very nice guy named Emery from Minnesota who knows you. Everything went very smoothly and the tiger wood is beautiful. Thanks for all your help! If you could use the same person to deliver the bed we ordered (Cheng is the name it is under...scheduled to deliver in March) we'd really appreciate that.